Signs By Benchmark recently enjoyed another successful collaboration with Indigo Signworks(Fargo, N.D.) to create a sign of monumental proportions. Installed on the campus of Lake Region State College in Devil’s Lake, N.D., the custom exterior sign has no trouble catching the eye – in daylight or dark. 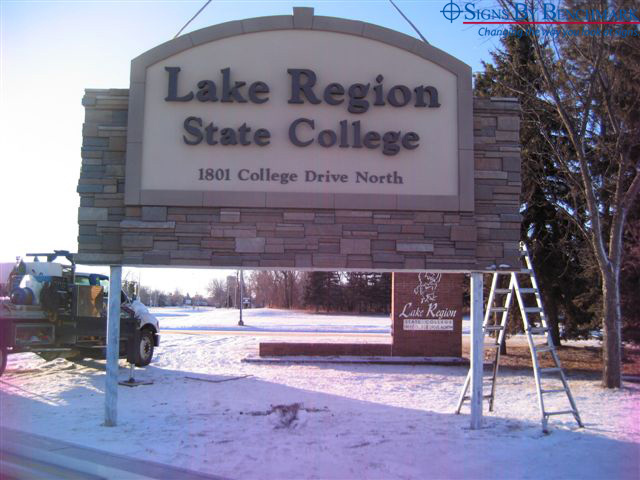 Featuring halo (reverse-lit) channel letters, the 12′ high x 20′ 2″ wide x 3′ 4″ deep double-sided monument features acrylic stucco finish and faux split stone handcrafted by Signs By Benchmark artisans. Designed by Indigo Signworks, the custom sign was based on Signs By Benchmark’s standard model #2. 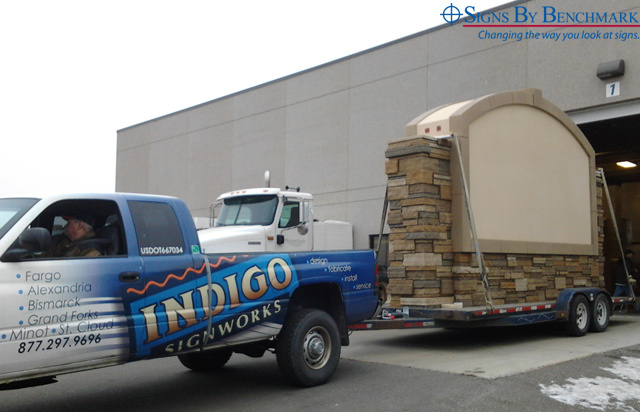 Indigo Signworks picked up the sign from the Signs By Benchmark plant in Watertown, S.D., then installed the channel letters in their shop. 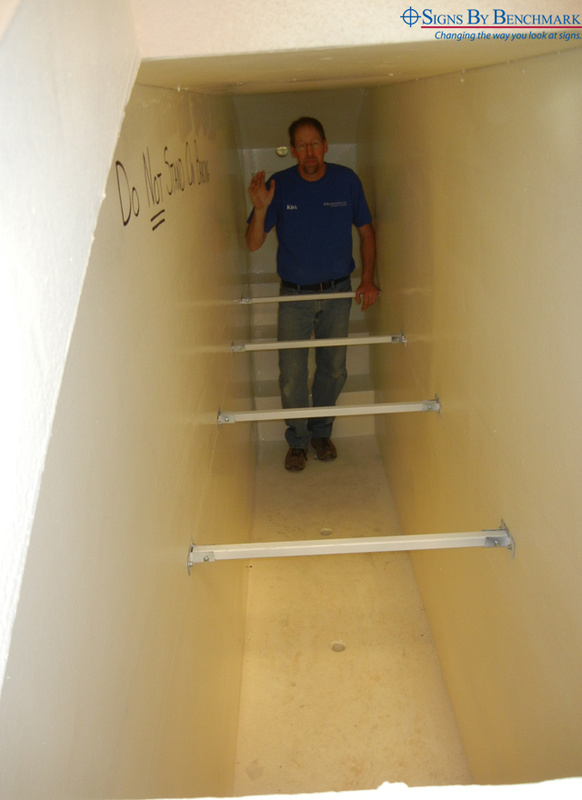 “Signs By Benchmark created the perfect design for installing wiring for the halo lit letters,” said Nelson. Sign installation was quick and simple. Working from exact placement dimensions provided by Signs By Benchmark, the Indigo team had poured the foundation some weeks earlier. The monument was easily craned over the poles using pick points that Signs By Benchmark had installed. 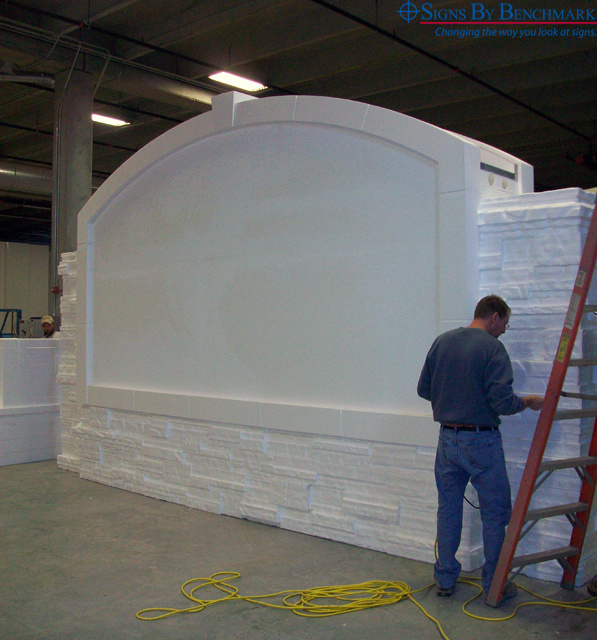 Give the team at Signs By Benchmark a call at 800-658-3444. 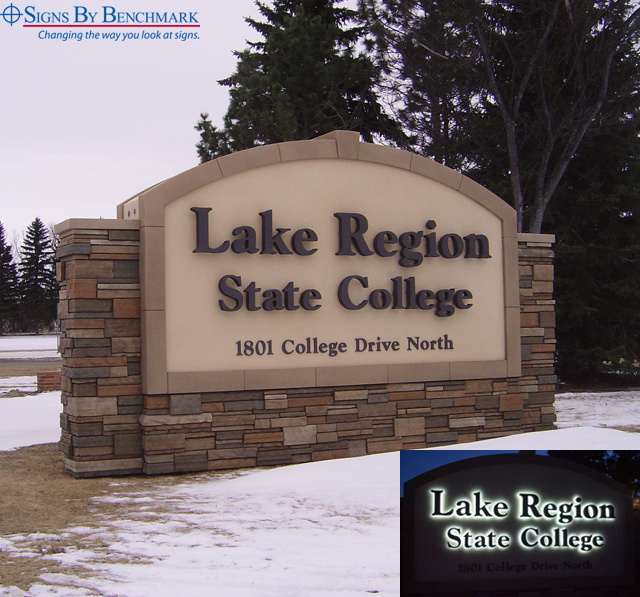 Tell them about your next sign projects – whether they call for large or small signs. Then enjoy a successful collaboration as the Signs By Benchmark team works closely with you to achieve the perfect signage for your customers.